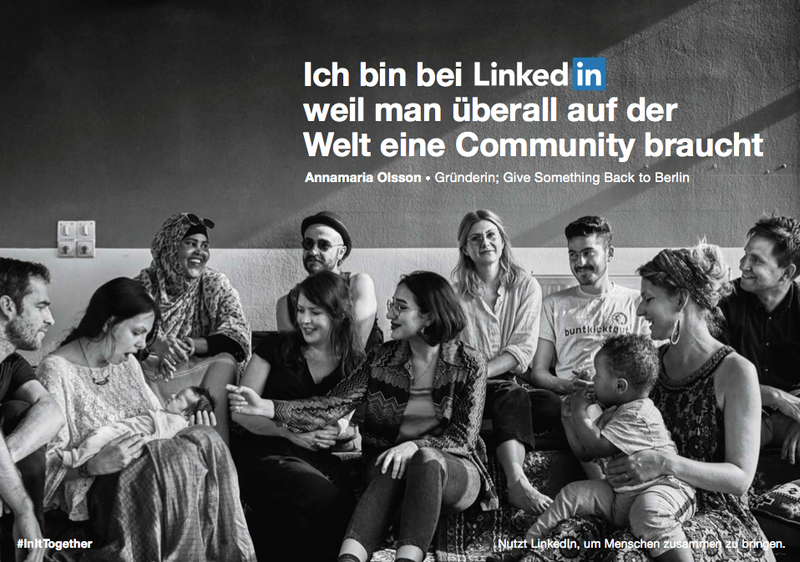 GSBTB is happy and proud to be part of a German nationwide campaign together with LinkedIn. As you may know, LinkedIn is one of the world’s biggest social networks for career purposes, with over 500 million users globally. Parts of the GSBTB team and community will be covering subway posters, billboards, clogging your newsfeeds and even cinemas in the next two weeks all over the internet and the four biggest German cities. What does LinkedIn even have to do with Give Something Back To Berlin, migrants and refugees? Well, quite a lot actually. Our slogan is “making worlds meet for a better city” – mirroring our aim to create meeting points between groups that normally wouldn’t come in contact with each other, build inclusive networks and counter anti-migrant discourse, which have been our goals since we started in 2013. All in all, we want migrants and refugees to be seen and treated as a potential and not a problem. As most of us know, this is NOT how everyone in the world sees it. Today we have a very shaky world order with nationalistic and xenophobic parties coming to the forefront and populist narratives growing almost everywhere. Walls are being built (real and mental ones) and politicians all over Europe are competing to win votes from far-right parties like the AFD, who campaign for the harshest immigration policies they possibly can. In this particularly historical moment it is therefore crucial to mobilize positive powers to create broad and open platforms and alliances for progressive social change. Showing that we are many and that if we work together – because of our differences – we are strong. Sensitizing and tying in the private sector (and not the usual world-saving suspects) is a complete no-brainer since in the end, that is where migrants and refugees will end up working. Having a player as huge as LinkedIn supporting and spreading this message makes us happy and hopeful even in dark times. We at Give Something Back To Berlin are happy contributing to these efforts a little every day, living and breathing diversity and inclusion with all its joys and challenges, creating community and connecting refugees and migrants with broad networks in greater society, while sharing experiences, laughter and fun in a sometimes broken world. We’re happy to share a little piece of that on a billboard near you. We are hitting the last week of the LinkedIn campaign that we fronted and are happy and proud of all the good feedback it received (including selfies from friends in front of billboards in different German cities!). Another cool thing is that the video portraying some of GSBTB’s work and world through hanging out with GSBTB’s founder, team and community members in Refugio and Neukölln, got over 500 000 (!?) views in less than a week.